- Antique print, titled: 'S. Geertruyden-berg' - (Plate 48). 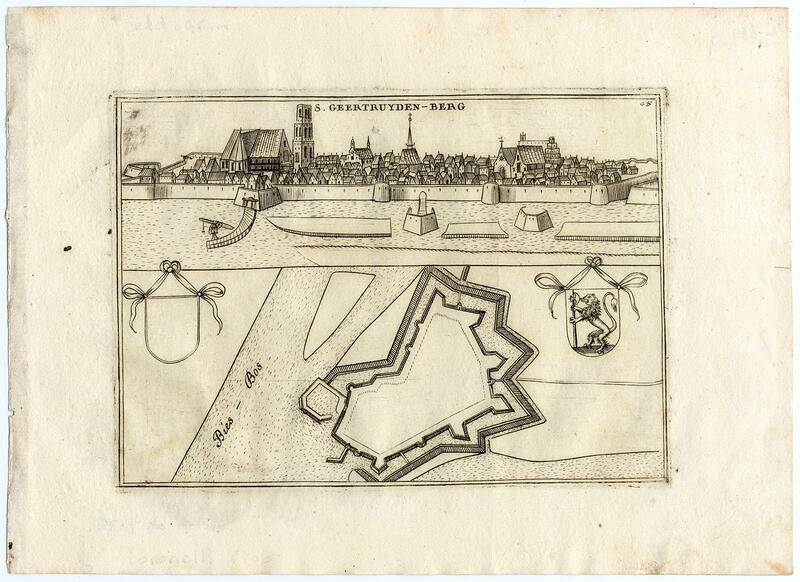 This plate shows a groundplan of the fortifications and view of the Dutch city Geertruidenberg . Etching/engraving on hand laid (verge) paper. Description: This scarse original old antique print / plate originates from: 'Teatro della Guerra' by P. Coronelli, 1706.Artists and Engravers: The author of this work is Vincenzo Maria (Padre) Coronelli (1650-1718): Father Corronelli was a Franciscan priest, who spend most of his life in Venice. He was a noted theologian and was appointed as Father General of his order in 1699. At that time he was already famous as a mathematician, cartographer and globe maker. He was very infuential, compiled and engraved over 500 maps. His most well known work is the 2-volume 'Atlante Veneto' but is is equally well known for his very large terrestrial and celestial globes. One, 15 feet in diameter he made for Louis XIV of France. Condition: Very good, given age. Some faint soiling in the margin. Small stain in left margin. General age-related toning and/or occasional minor defects from handling. Please study scan carefully. Storage location: C292-16 The overall size is ca. 10 x 7.1 inch. The image size is ca. 7.1 x 5 inch. The overall size is ca. 25.5 x 18 cm. The image size is ca. 18 x 12.7 cm.